I can honestly say I'm looking forward to seeing Agent Carter tonight on ABC. And it's not just because of the Marvel connection or my obsession with Agents of S.H.I.E.L.D. It's also because, as mid-season replacements go, anything has to be better than Galavant. I caught the first two episodes of ABC's new musical comedy series Sunday night. No, make that endured. Galavant fancies itself a medieval fairy tale send-up in the gleeful spirit of Spamalot, Shrek, The Princess Bride and Enchanted. Instead, it's just a humorless ripoff--and a tepid one at that. 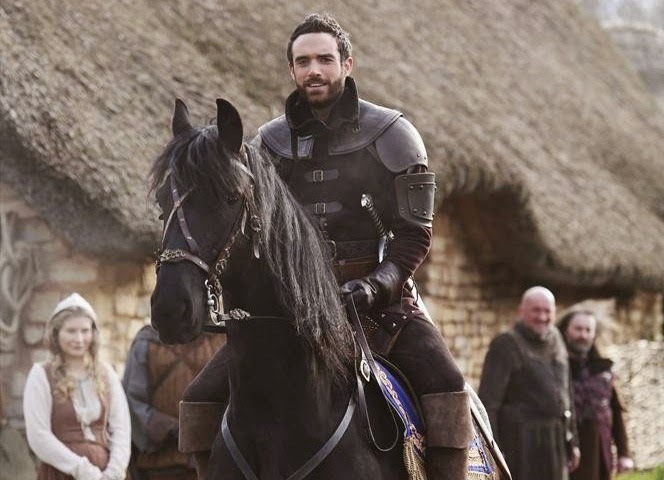 Our hero, Galavant (Joshua Sasse), is a noble knight who has it all: looks, charm, strength, the admiration of the common folk and the passionate devotion of his lovely lady love Madalena (Mallory Jansen). That is, until the smarmy, evil King Richard (Timothy Omundson) takes a liking to Madalena, kidnaps her and forces her to marry him. Galavant races to her rescue only to be dumbstruck at the alter. It seems his would-be soulmate is also greedy and power-hungry. She's had a change of heart. Marrying the King won't be such a bad gig after all. Time passes and the heartbroken Galavant has sunk to the bottom of a wine barrel when he is approached by Isabella (Karen David), a princess from a neighboring kingdom with an ax to grind against Richard. Or not. She says she wants to enlist Galavant's help to wreak vengeance on the King, but she may just be a pawn to lure the besotted knight back to Richard, who has plans to kill Galavant. The plot sounds engaging and complex enough on paper, but it's really just a wisp of an idea to get Galavant to the next joke or the next musical number. And that wouldn't be so bad if the jokes weren't so flat and the music so annoying. One of the great disappointments of Galavant is the song score of no less a talent than the great Alan Menken (The Little Mermaid, Beauty and the Beast). He composed the songs along with Glenn Slater (Tangled) and acts as one of the show's executive producers. And while there is some clever wordplay, there's little noteworthy or memorable about the songs. Menken could use more of the inspiration that allowed him to merrily skewer animated musical conventions in Enchanted. Galavant will continue to run two episodes each Sunday night starting at 8:00/7:00 Central through January 25th. Please, Agent Carter, be better.